With the introduction of E-MTB, riders can go farther and faster than ever before. HD-e840 offers unparalleled performance for eMTB riders. 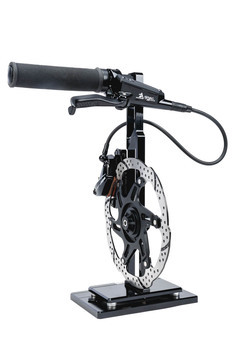 It utilizes a completely new design to offer a brake engineered specifically for eMTB. The weight being a less predominant factor in e-bikes, rotor thickness was expanded to 2.3mm – lowering heat buildup by 8% and reducing rotor deformation by 15%. 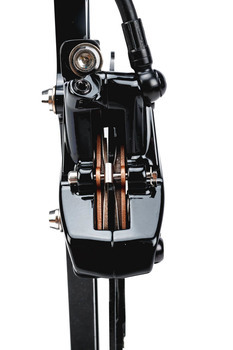 The caliper is designed specifically around 2.3mm thick rotors. The caliper utilizes an open top design for easy pad replacement when working with the added weight of an eMTB. The caliper also features hybrid pistons offering the ideal blend of lightweight heat management and smooth reliable actuation. 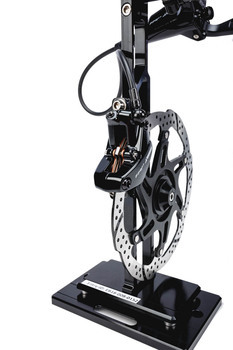 With its thick disc and pads, this brake has been specially designed for the requirements of e-mountain bikes. The result is a longer service life and longer maintenance intervals.